The Jeanneau boatyard in France is home to some of the best sea-going vessels around the world, and the stable is – at least in my opinion – responsible for propelling a large part of the industry towards pushing the boundaries in creating not only masterpieces, but boats which are as capable as they are beautiful. 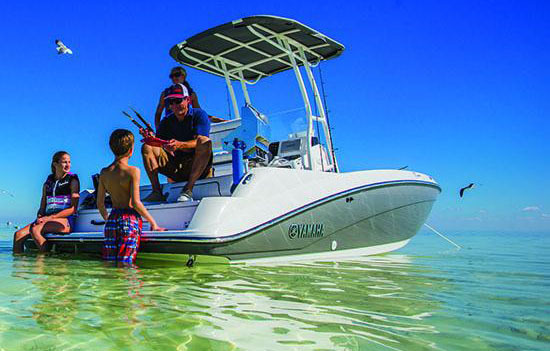 It is little wonder then, why their Cap Camarat range has been doing exceedingly well, claiming countless accolades from the world’s finest boating publications and winning the hearts of boating families around the globe. 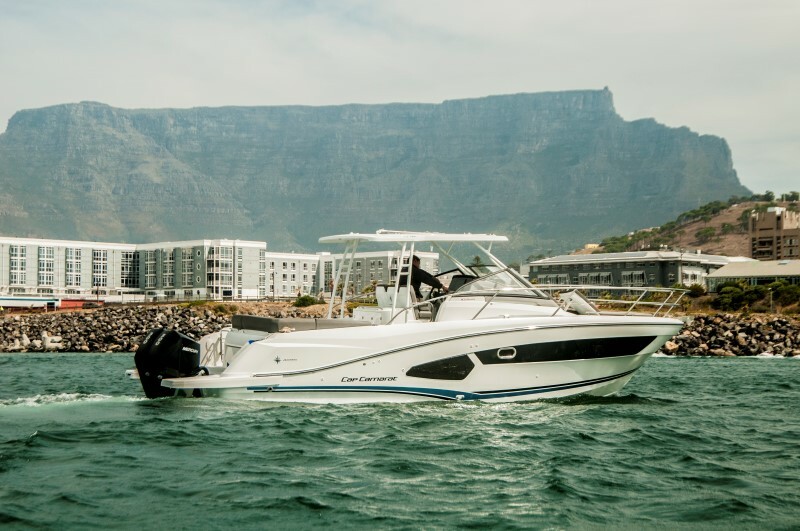 Join us to take a closer look at Jeanneau’s Cap Camarat 10.5 WA to see why this craft has been turning heads. 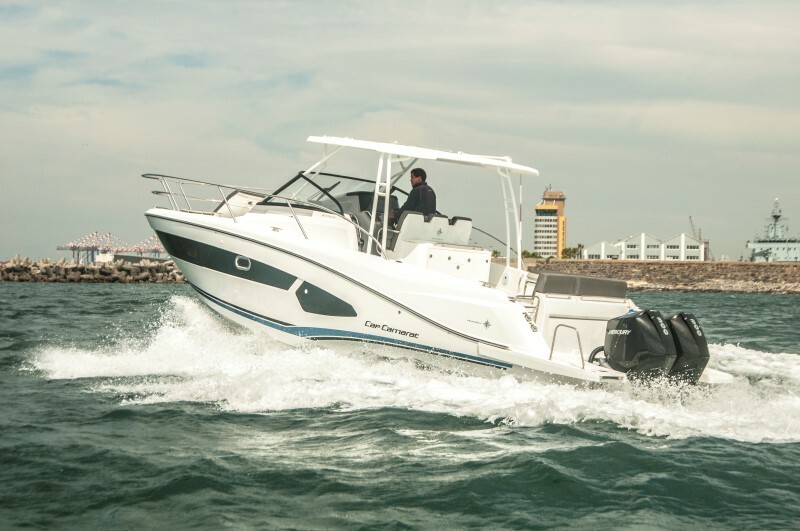 The Cap Camarat 10.5 WA we tested is the first one to arrive in the country. 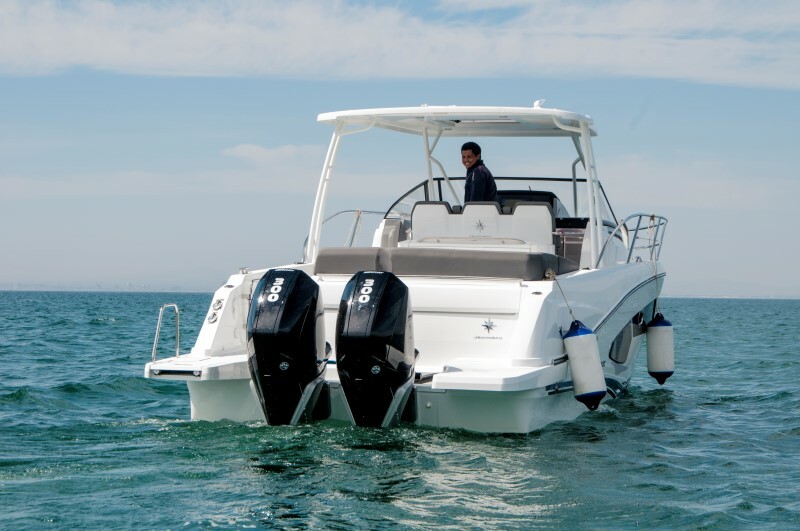 I’m told that it’s also the first boat here which is being paired to Mercury’s newly launched 300 HP Verado V8 outboards! 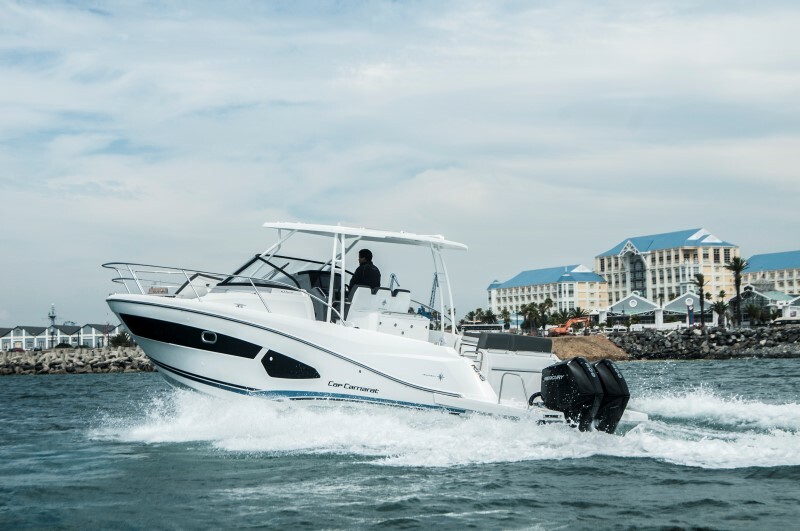 It carries the burden of great expectations, as the manufacturer has been hard at work to develop several aspects to make this centre-console walk-around cabin craft worthy of greatness. 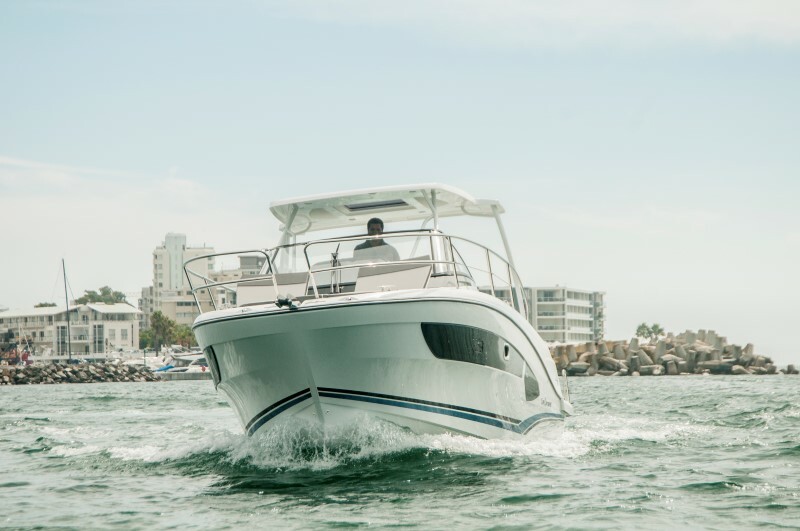 Hopping on board, you are immediately met by elegance through quality craftsmanship, luxurious materials, an abundance of amenities and sporty design flair. 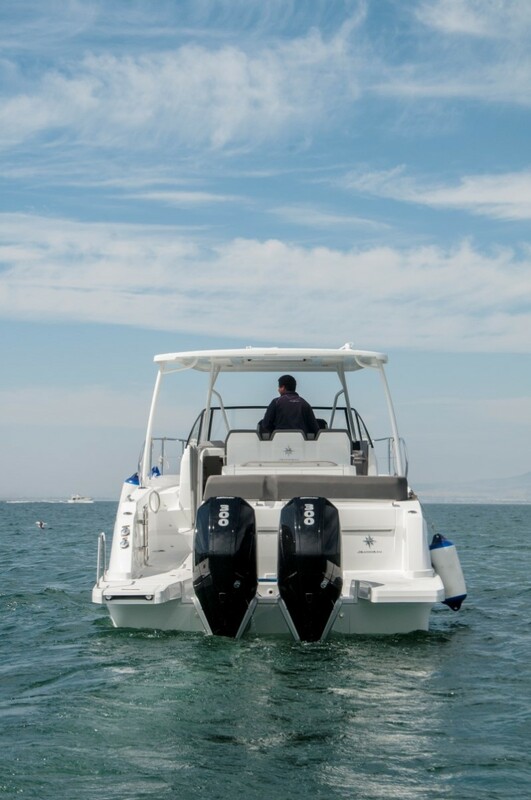 Starting at the stern, you’ll find a generous, oversized swim-platform which makes for easier boarding – from the dock or the water. 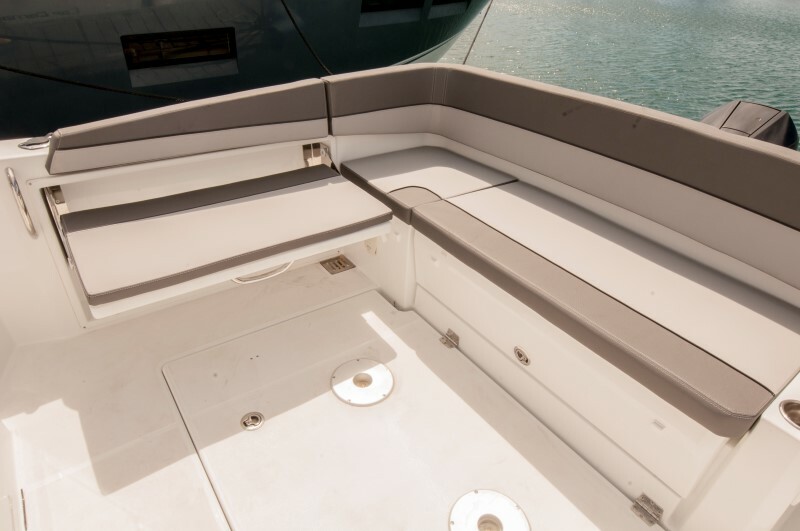 From here, access is gained through the port-side entry which has a closable gateway providing security while underway. 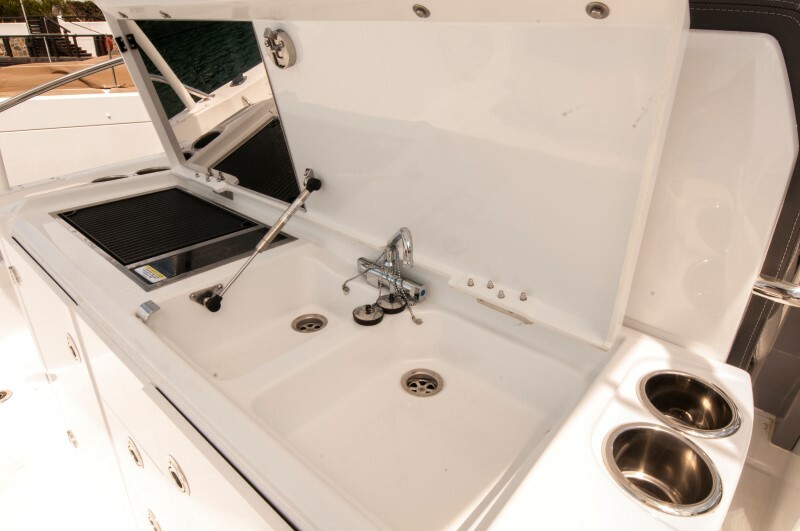 A retractable deck wash is neatly stowed in the gunwale for use when required. 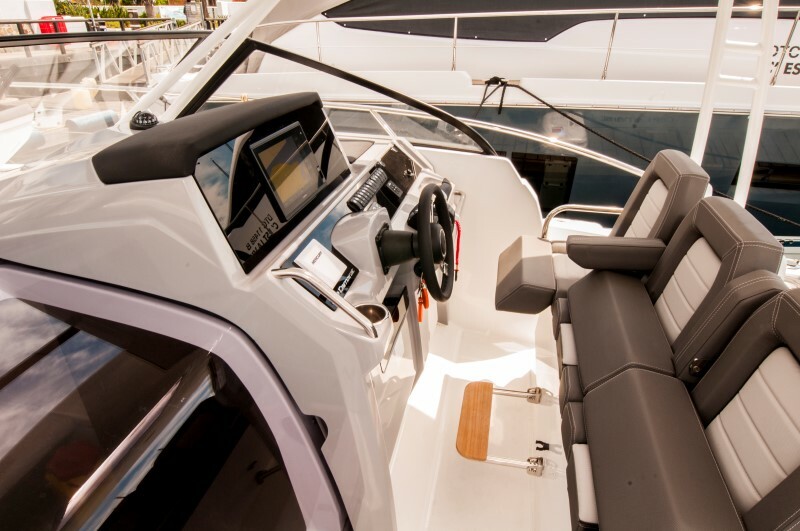 At the stern you’ll find a traditional layout which features a large, comfy bench-style seating for the dinette. 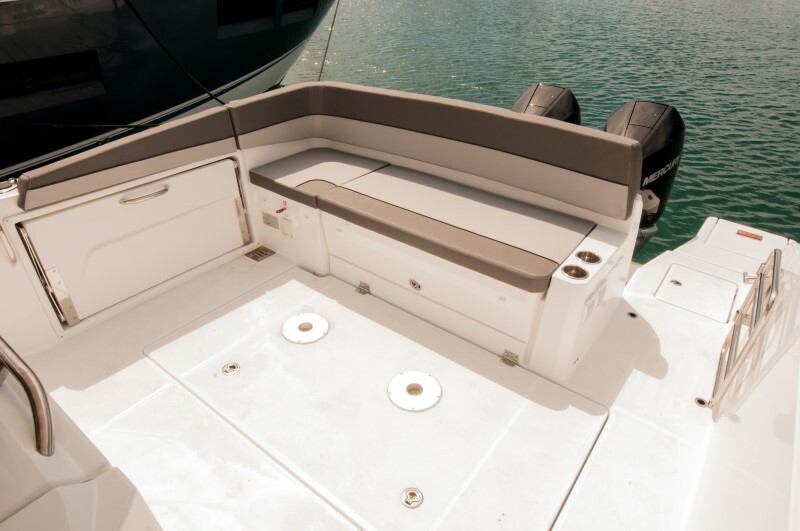 Adjoining seating to starboard can be flipped up and into place, meaning that it’s there when you need it, or grants you greater deck space when you don’t require additional seating. Naturally, a large table can be easily inserted into the deck to present your gourmet meal. 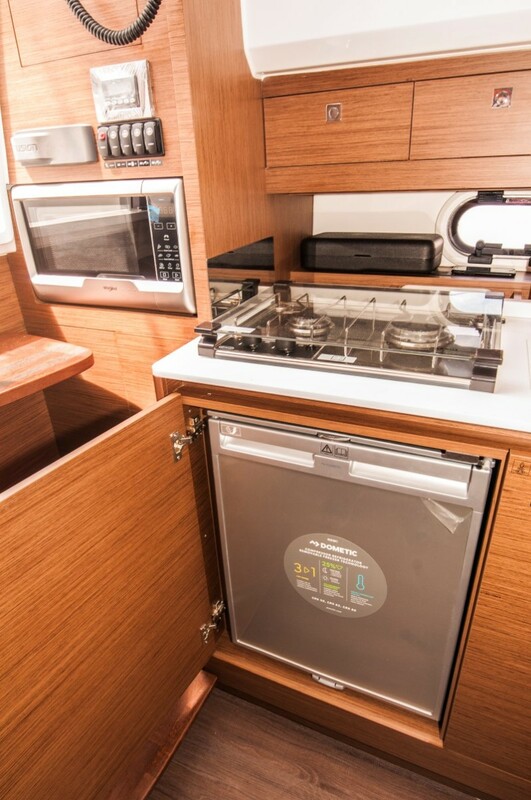 Situated on the back of the centre-console seating, is a mini-kitchenette which features a fridge, food-grill, washing up basin, and storage. 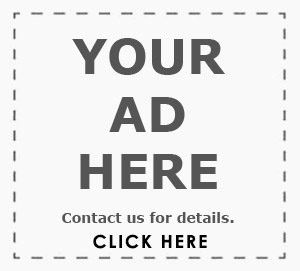 This area is neatly concealed and unobtrusive when not in use. 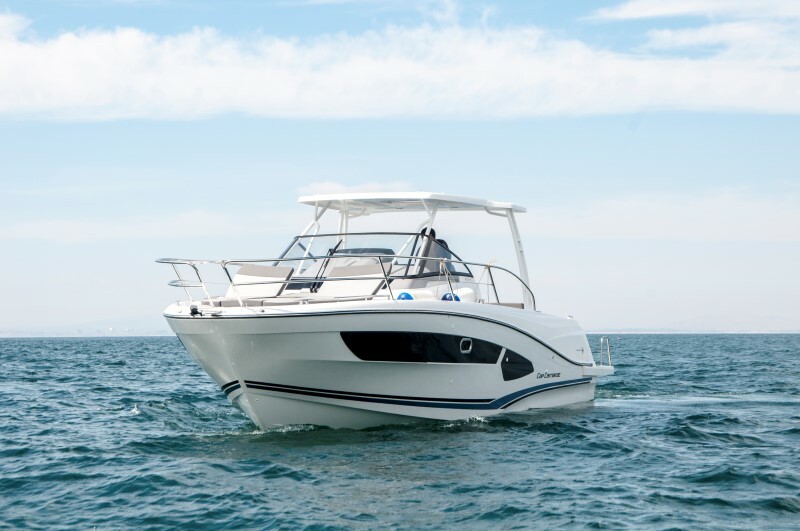 To keep you cool on hot summer days, look forward to a welcomed retreat under the fantastic, large optional Hard Top which is more convenient and practical than a Bimini – and much better looking too! 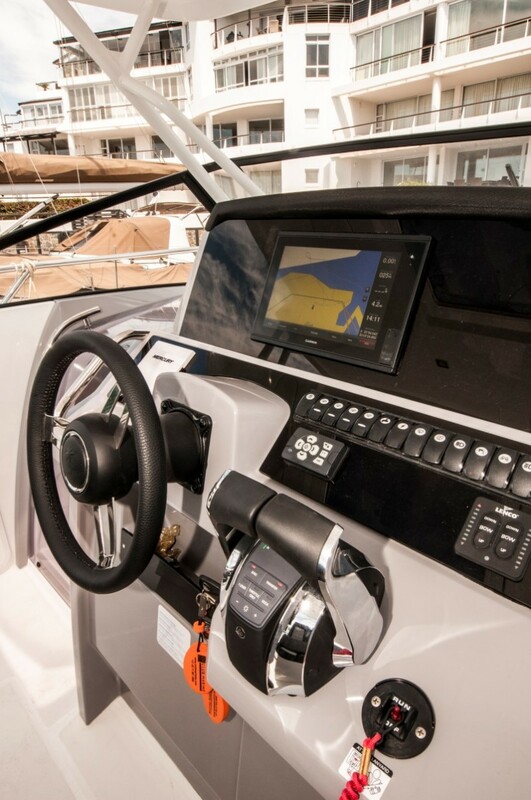 Midship is where you’ll find the pièce de résistance – the driver’s cockpit. 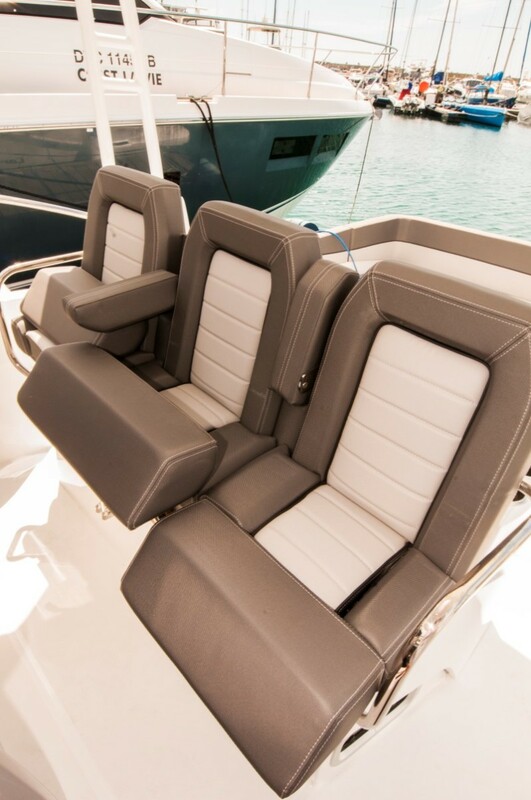 With individual armrests, bolster cushions and foot platforms for three, this luxurious area really does grab you. 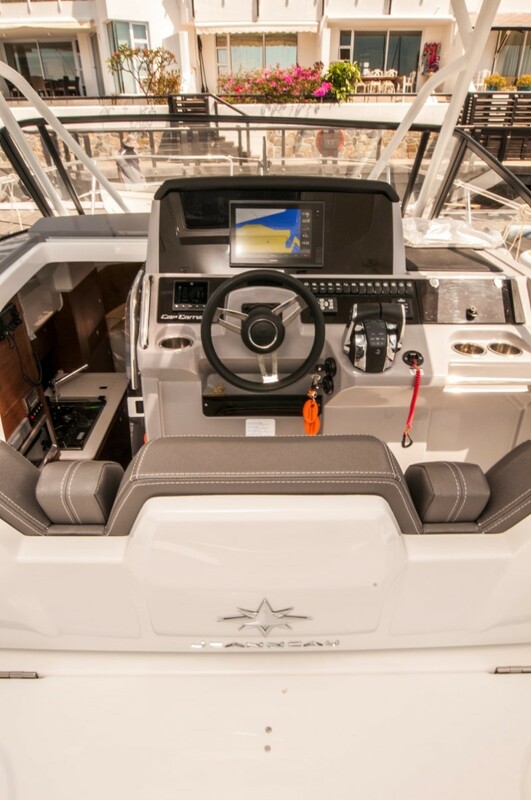 From here, you have a clear view around the craft, as well as to the control switches, smart Mercury control unit and a Garmin navigation unit. There’s still plenty space for more gear in the dash should you need it, but I like the uncluttered, clean look. 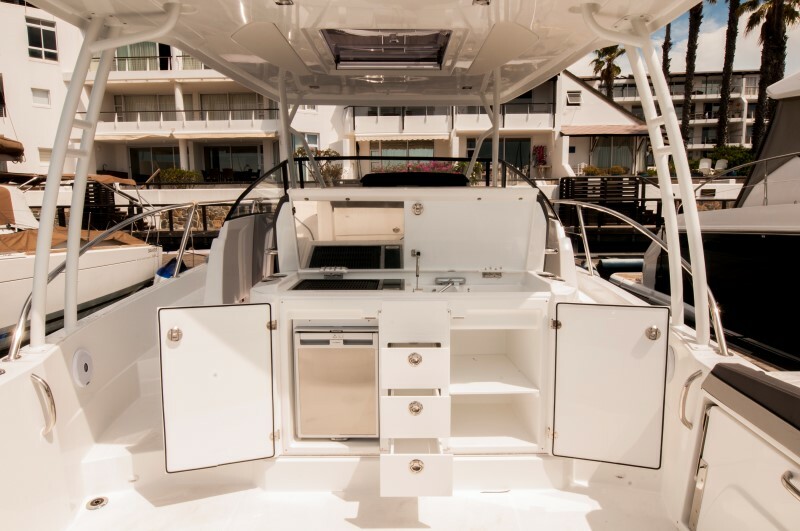 When it comes to tanning, guests are afforded an easy and secure path along the gunnels to find their ideal spot on the bow where the full-length loungers have tilting backrests to give the perfect position for soaking up the sun rays. 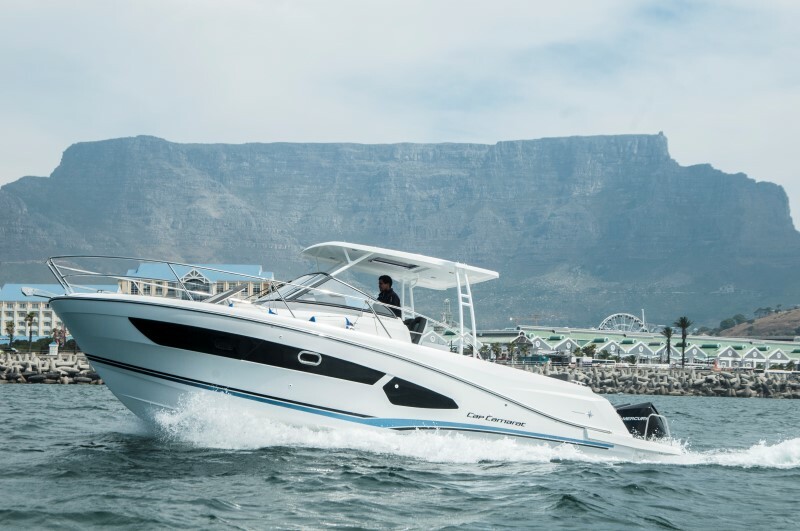 Although she pushes the measuring tape to 10 meters in length, this sporty cruiser becomes almost otherworldly when you take a few steps below deck. 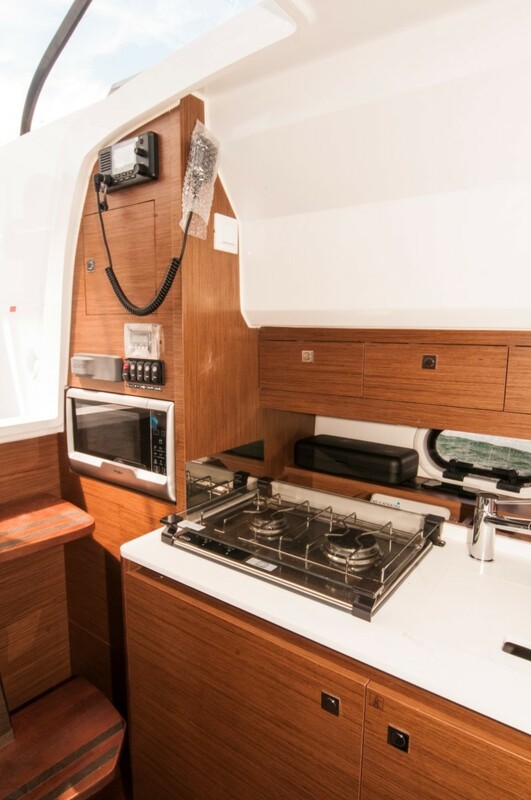 To port you’ll find a stove, sink and fridge and food prep area, while to the starboard side you’ve got the water closet, which offers a basin and mirror, a large head unit and a separate shower cubicle. Aft, a double bed turns into a twin bed by removing the centre cushion. As you’d expect, headroom here is reduced – but it’s important to note that the amount of light entering through the side portholes makes the area feel lighter and larger than it is. To bow, the traditional dinette is very welcoming and airy thanks to the side windows and decent head height. Should you be spending the night onboard, simply lower the table and close the sliding curtain to transform the space into the main cabin. 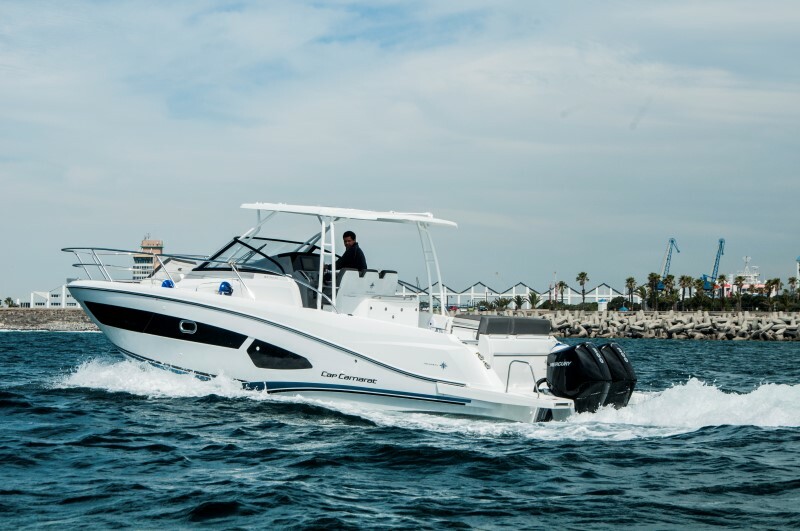 Since our test, the Jeanneau Cap Camarat 10.5 WA has been fitted with the latest Mercury 300 HP Verado outboards (we’re doing a separate in depth test of the power from these engines). 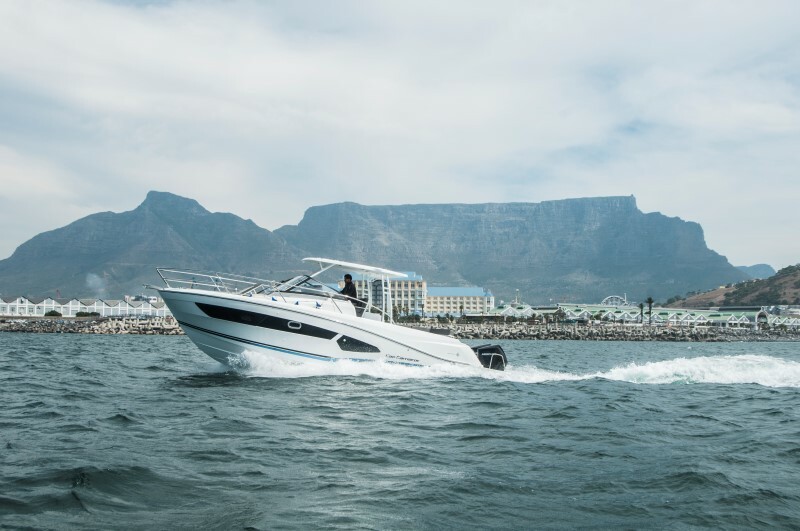 In this review, however, we’ll focus more on the handling and ride characteristics – and since this craft comes from one of the leading boat designers, it really is hard to fault. 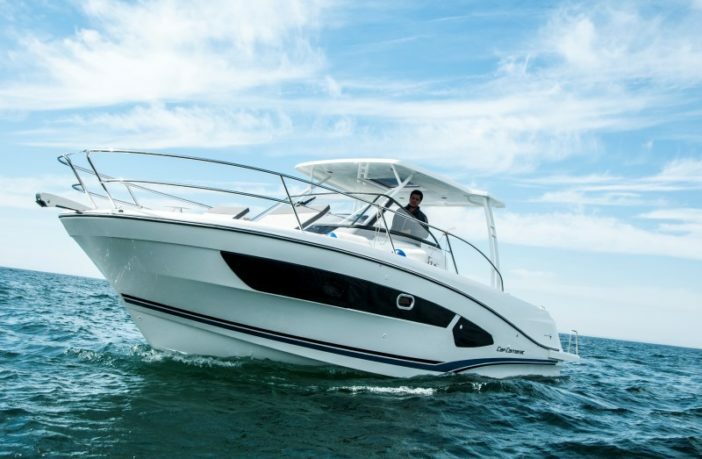 It’s a well-designed double-stepped hull, more than capable of weekend cruises but boasting speed and fun. 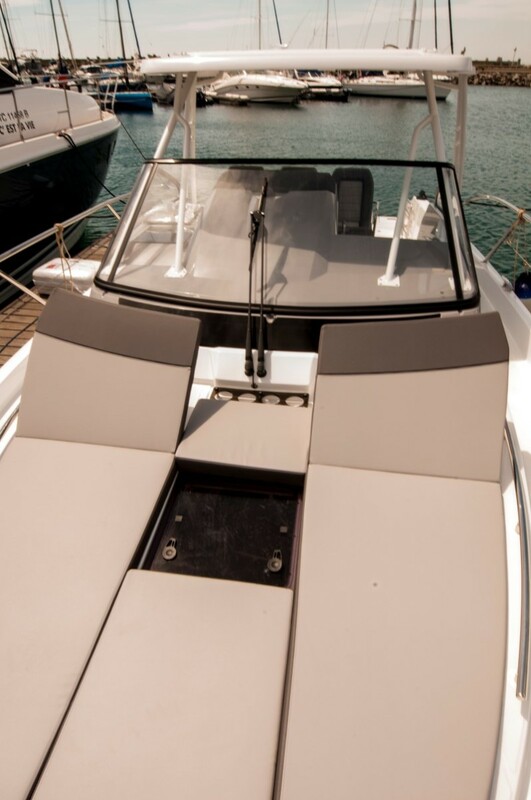 The skipper’s position, being almost directly in the middle of the boat, is ultra-comfortable and the visibility is exceptional. The windshield gives plenty of protection or clear covers can be installed should the weather start to turn. 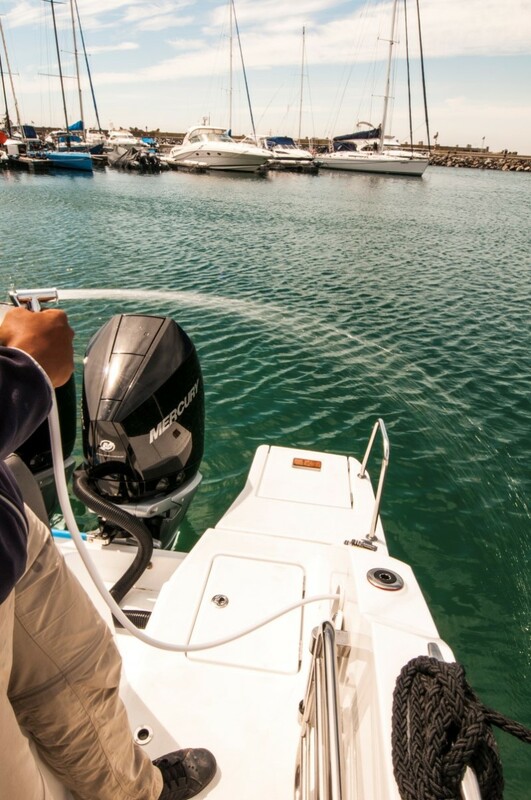 Although the steering wheel sits comfortably in your hands, it’s the throttle that gives pure pleasure. 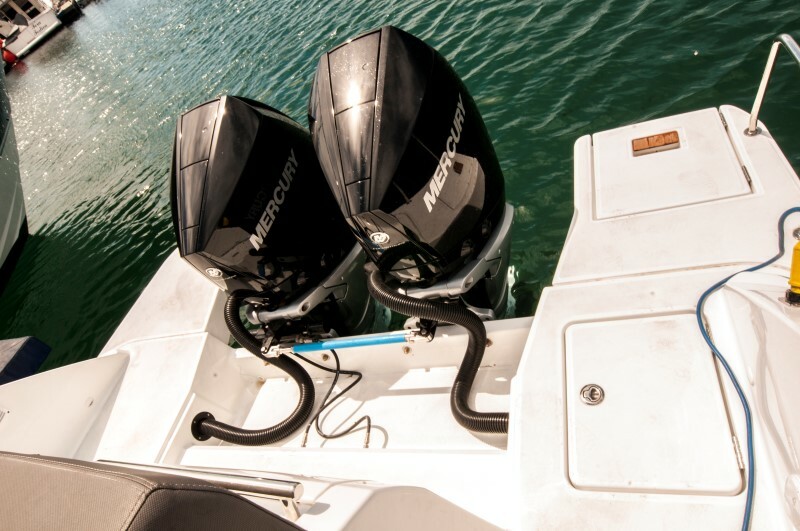 A combined 600 horses, displacing 9.2 litres from the Verado outboards is enough to jump-start a planet – and it provides a raging response on the transom. 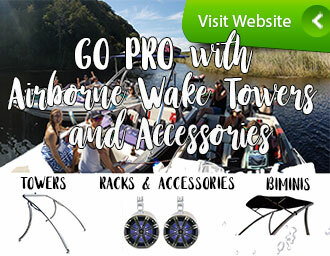 We were only a crew of three people and the sea conditions were about as flat as the Vaal River, which really allowed us to stretch the Mercury’s legs. Into the wind we saw a top speed of 39 knots (72 km/h) at 6 000 rpm. 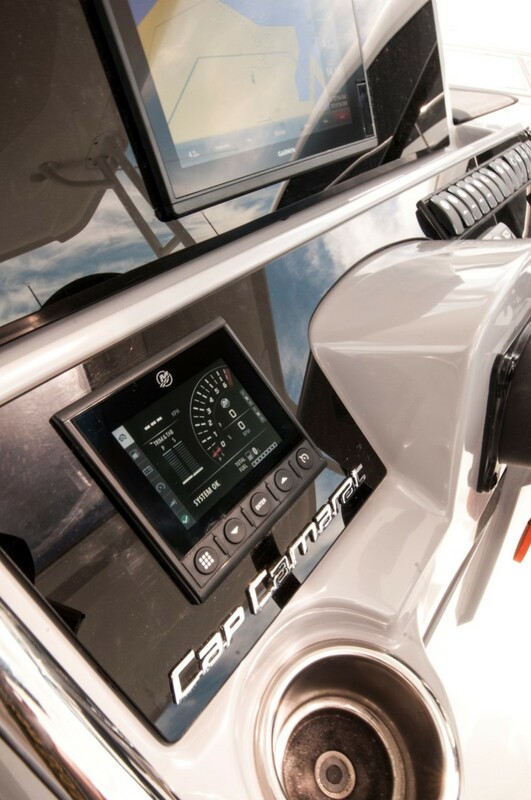 The computer gauges at this speed gave a fuel burn rate of 95 litres per hour. 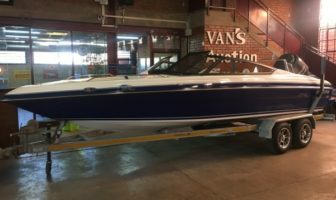 Even though this is full taps, the hull ran smooth and comfortable and the steering tracked true, holding much of the speed through even the corners. 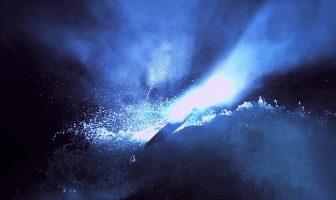 It must also be said that full lock turns at speed leans the hull heavily onto its side as it grips the water, powering its way into an almost unbelievably tight angle. 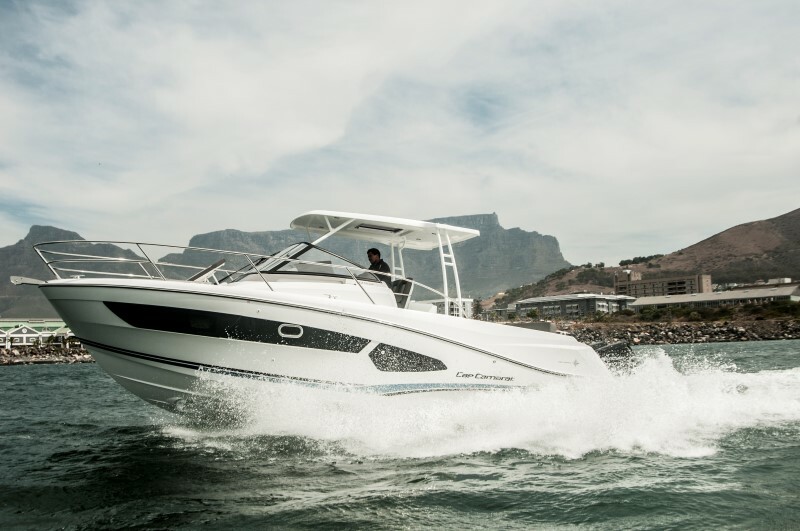 Bringing the throttles back to a very comfortable 16.6 knots (at 4 000 rpm), expect a fuel flow of around 38.5 litres per hour. 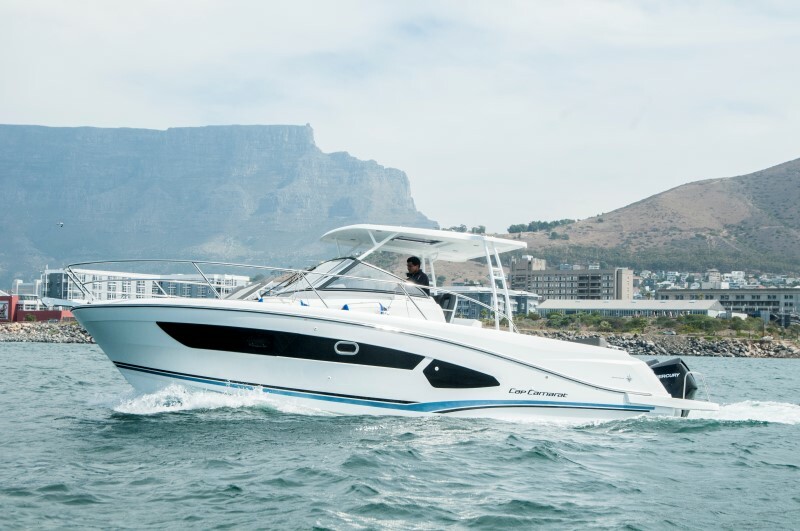 At this speed, the rear seating area is almost windless and your guests can enjoy a glass of the finest champagne without spilling a drop. I can’t imagine it was just the perfect sea conditions on the test day; this lengthy, naturally commanding hull should be able to handle big seas, which would have you grabbing for the nearest life vest in other boats. 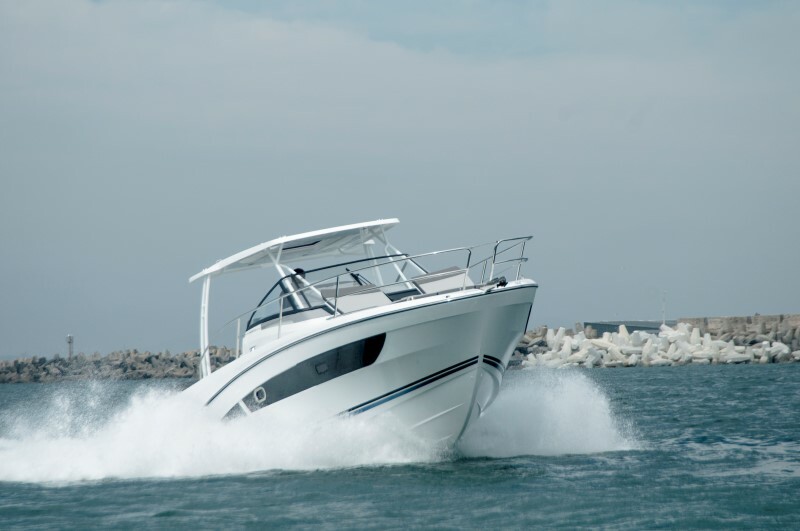 This is a serious offshore boat for those who appreciate what she can do. 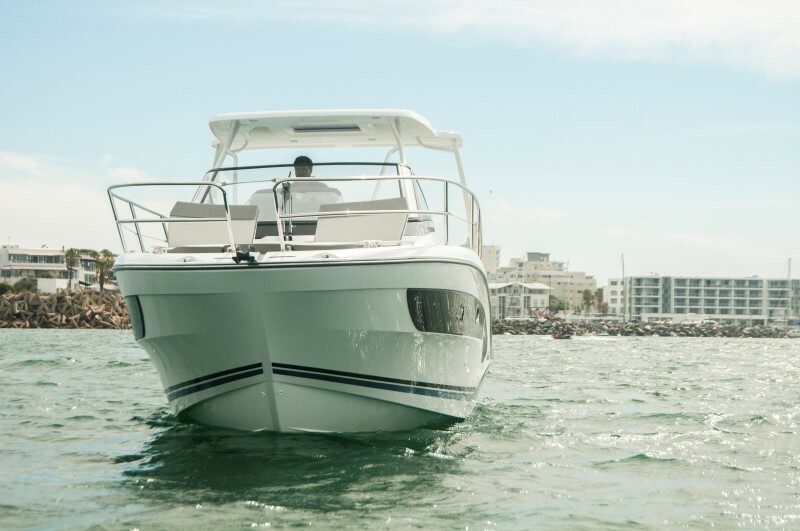 The Jeanneau Cap Camarat 10.5 WA can accommodate up to nine guests for a fun day on the water or be the idyllic overnight getaway for you and your family. 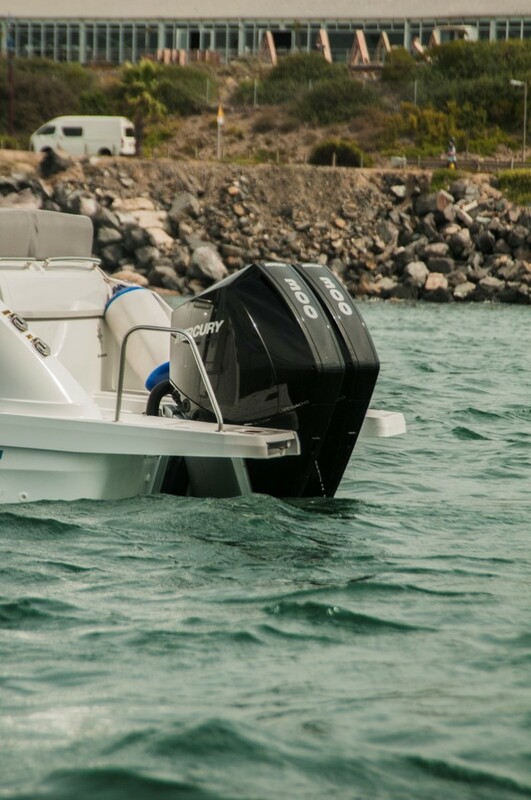 Such a versatile craft will find its feet anywhere. 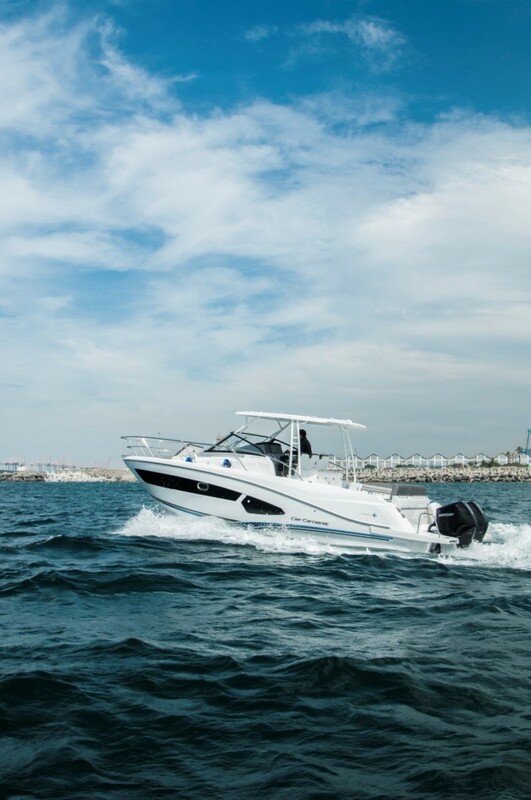 1.2 Metre swell, temperature 22°C, 15 knot wind, half tank of fuel, salt water, 3 passengers.